Khaled Hosseini's debut novel "The Kite Runner" is thought to be the first to fictionalize Afghan culture for a Western readership. Khaled Hosseini is your Connector of the Day. The haunting 2003 international bestseller - a tale of two Afghan boys growing up against the backdrop of an emerging Taliban, has led to Hosseini's name being placed firmly on a list of literary names to watch. The controversial novel is currently published in 48 countries, and has led to the equally controversial Oscar nominated film of the same name. 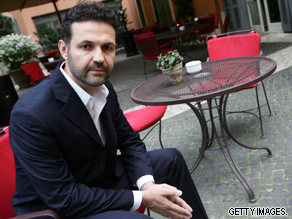 An Afghan asylum seeker to the United States, Hosseini has since used his profile and experience to form "The Khaled Hosseini Foundation," a nonprofit focusing on humanitarian assistance and education projects for the Afghan people. The idea for the organisation came about during a trip to Afghanistan Hosseini made in 2007 with the United Nations refugee agency, 'UNHCR', with whom he is currently a Goodwill Envoy. It has resulted in shelters for the needy, student scholarships and much-needed funds for teachers and classroom rebuilding. Hosseini released his follow-up novel, "A Thousand Splendid Suns" in 2007, once again to critical praise. Returning to the themes that made 'The Kite Runner' so emotive, the story again focuses on the intertwined lives of two Afghan locals, while the future film rights have been sold to Columbia Pictures. Put your questions on this heavily misunderstood nation to one of the leading literary and humanitarian voices of Afghanistan, and he will answer them in our interview. Leave your questions below and be sure to include where you're writing from. What – if anything – should the western world be doing to help Afghanistan that it has not already been doing? If there is a way to be good again, what must the United States do in order to make up for what has been done to Afghanistan? What will help the country? I have read A Thousand Splendid Suns and loved every minute that I was reading it. It was largely because of your book that I became interested in the present issues as well as the history of Afghanistan. I recently wrote my thesis on the work of the World Bank in Afghanistan and its policies that aim to achieve gender equality in the country. The concept of gender equality is extremely ambiguous and context specific. Many international organizations view gender equality from the perspective of developed countries, meaning that employment, education and government participation is important. What does gender equality mean to women in Afghanistan? Does it differ among the various ethnic groups in Afghanistan? Do you think that policies of the World Bank and other international organizations affiliated with the U.S. and Europe have a good understanding of gender in the country and can their program be effective? Do you think there is hope for Afganistan to be one country or do you think it is destined to be just a number of tribes? Why do you think, the U.S. is in Afghanistan? Should the U.S. be there? – How will Afghanistan connect the world to make it a Better Place? –	How will you Improve the lives of young ladies and men who are living under poverty line in Afghanistan? I am awaiting Khaled Hosseini’s replies. Do the Taliban really believe they they are doing God's work? Or do they just enjoy the power they have over others especially woman by appearing to be guardians of morality? And if they do believe they're doing God's work, how do they square that with sexual abuse of boys? While child abuse is obviously wrong, strict Islam also comes down hard on homosexuals. Also wanted to add that it was shocking to ready about Laila deciding to accept beatings to visit her daughter in the orphanage. While I knew intellectually about unescorted women being beaten, it was somehow a disconnect to identify with a character in a story living like that. Your books have definitely sparked an interest in me in Afghanistan and Central Asia in general, not just politically or religiously, but culturally as well. Young people in the U.S. aren't always presented as globally-aware and empathetic, but "A Thousand Splendid Suns" was the only book I ever heard anyone in my (university) classes say they couldn't put down, and it inspired remarkable discussions. I read recently that young people make up a very large percentage of the Afghan population. How do you think young people in Afghanistan can organize and work to improve the lives of the Afghan people? How do you think youth in Afghanistan, the U.S., and elsewhere could work together cross-culturally to tackle social problems? Also, we're all waiting for another book! If you could make each person in the Western world know one thing about Afghanistan, what would that be? about Afghanistan before reading your Book. When I was reading it , I could not believe the pain some people here on same earth are going through. Now there was a video from (it says new Osama Bin LADEN) a person explaining why they attack WTC . The reason is Israel. Then the video says (on cnn news) the Taliban will fight forever because US have invaded their country. I thought US is after terrorists who are hiding in Afghanistan hills. are your books sold in Afghanistan? do you know how they were accepted by locals there? Are there any plans to make "A Thousand Splendid Suns" into a movie? I think that this would go a long way towards opening the eyes of many westerners to the real plight of Afghan women. You can tell by these comments and questions just in how high regard you are held. I read The Kite Runner last year, and I have asked the usual question on your website, will once again. It is the question that all of are asking: what should we be doing? You may need to write another book in order to provide the answer. Here I have the opportunity to ask you the most unique and probing question that I could come up with, and this is all I can manage, this question. I have read half a dozen books on the history of the region including Ghost Wars by Steve Coll and The Great War for Civilization by Robert Fisk. And that is all that I can manage. You may not be surprised to know how many of us want your best shot at answering this question. what can one expect from Khalid!! He is just a writer and an asylum seeker. It is the US government that has to think of changing the lives of Afghans. The US in order to retain its supermacy has challenged the lives of innocent Americans and rest of the world. She should now realize that they are in hot waters. They can never ever win the war in Afghanistan. Afghans will eat grass like North Koreans, but will never accept the rule of an outsider!! The Kite Runner was a gift to me and I loved it so much I went out and got A Thousand Splendid Suns the day after after I finished Kite Runner. The imagery and lifestyles of Afghanistan before the wars are something many have long forgotten. We've heard so much about what's good for Afghanistan from the Afhan and US governments, the UN, and of cos the Taliban. Based on your research and understanding, what do Afghans in the street want or need? What does the the rest of the world need to do to help them achieve this? Before your books were published, the only reference I ever had to Afganistan was the depiction of Pathans in the Bollywood films and also in Rabindranath Tagore's play, "Kabuliwala". I liked what I knew and then came the reality of the Taliban. All I want to say is I pray that your country and your people find the way to retrieve the peace and lead lives that give rise to those jolly personalities that symbolised Afganistan to me. I now know that that symbol is very limiting and does not represent the country entirely, but I pray that Afganistan regains its true essence once again. Sorrow and grief are part of life, but when they come in unsurmountable proportions and break the human spirit, there is something so unnatural about it that it has to end. I pray for that end. You are such a gifted writer and take this opportunity to salute you for sharing insights into the Afghan experience via The Kite Runner. 2) The political landscape is less than desirable while the people 'hold on' to memories of the 'good old days'. In the Jamaican context, marijuana and music are often used as an escape where as opium tends to be the drug of choice among Afghan youth. How could our nations learn from each other? More importantly, what are your views on Caribbean nations, like Jamaica & Barbados? In your opinion, could these CARICOM states make a meaningful contribution (improvement) in Afghan youth lives? If so, please share how? How real are your characters? How many Mariams are in Afghanistan hopelessly dying without anyone helping them? How can WE do to help these people to have a life on their own without fearing somebody else will take it away from them? According to you, why are events in Afghanistan and Iran, that have had and continue to have a profound impact on the entire world, receive so little attention in the American film industry (your kite runner being the exception)? I have read both your books and i would like to salute you as a great writer. You make your readers feel that the characters in the books are real and this is very emotional. What inspires you to write about Afghanistan and how long does it take you to complete writing a book? Your writing is beautiful despite the ugly facts that it reveals to the reader. I was born in Southern Iran and was lucky to witness it in the days when women could speak freely and have a chance to decide their own future. Unfortunately, it has gone back to the dark ages especially for women but for men also. I think that until Iran becomes stable and truly democratic (if that even exists in the real world) that Afghanistan does not really stand a chance for lasting peace and equality for women. Any thoughts on this? Mr. Hossein, I am a American living in Kabul for the past two years, I have had the pleasure of experiencing the beauty of your country and its diverse culture. I read both of your books and enjoyed the film. I travel daily to multiple locations around Kabul and surrounding areas, in general I have found the Afghan people I interact with congenial and polite. In my short time in your country, I have noticed change (at least in Kabul) from simple things like the presence of traffic police and road repair crews, which from a western perspective we may take for granted but these are bright signs of progress here. I am interested in understanding your feelings about progress in Afghanistan since 2001 and out of all the unfortunate pain the last nine years has produced, if you feel that the Afghan people have benefited? I enjoyed Kite Runner and Thousand Splendid Suns so much. I can honestly say that they are only 2 of 3 books that have ever made me feel that I was actually THERE in person, as if I was invisible to the characters but was able to watch them and all they did (the third book is To Kill a Mocking Bird by Harper Lee). Not a political question as there have been enough of those. Do you really miss your home country? Do you still have family there and have you had the chance to see/visit and stay in contact with them? Thanks for the opportunity of asking you what is possibly a private question. I look forward to reading you VERY soon. My question is, what does he think is the main issue facing Afghanistan today? Is it lack of education, corruption in government, financial hardship? After reading your incredible books, I was wondering what we could do as civilians to help the Afghan people? Many Afghans in Afghanistan I have spoken to say you are making a living off exploiting their plight and are disconnected to today's Afghanistan...how would you address that?